Under eye concealer can be your best friend to wake up tired eyes and brighten dark circles. But, as shown in these celeb photos, if not applied properly it can look odd and unnatural, drawing unwanted attention to the under eye area. These glowing white half-moons look worse than the dark circles they're covering! Pick a concealer that is close to your skin tone, not too light or dark. Many people think that the best way to camouflage dark circles is by using a light-colored concealer, but this usually ends up creating a grayish effect. Instead, opt for peach or pink-toned concealers. Pink tones are great for brightening up dark circles, while peach tones are great for balancing out blue or purple under eye veins. Avoid "light reflective" or "brightening" formulas. While these formulas look great in natural light, stay away from any concealer that contains titanium dioxide particles, as these create the white half-moon effect under flash photography. Opt for creamy formulas that offer good, natural coverage without being too opaque. Use your light reflective formulas to highlight the inner and outer corner of the eyes (areas circled in picture). Don't just use concealer in the areas directly beneath the eyes. One fool-proof way to make sure you don't get those glowing half-circles is to extend the area where the concealer is applied beyond the under eyes. Use the "triangle" method: apply concealer from the inner corner of the eye, down to the nostril, and back up to the outer corner of the eye (triangle in picture). Be sure to blend well! This will brighten the entire face and will look much more natural, even if the flash of the camera does cause your concealer to look lighter. Lightly set with powder all over the face. Setting concealer with powder is a great way to make it stay put, but applying it just over the concealer can look obvious (like Nicole Kidman here). 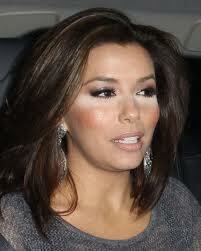 Use a large fluffy brush to lightly dust translucent powder over the whole face. Use light, broad strokes to avoid caking powder in certain areas and not others - this will allow the flash from photography to bounce evenly off the face, instead of catching certain areas where the powder is caked. With these easy tips, you'll look flawless, whether you're being photographed or just going out for the day! Thanks for this post! It's really helpful. I've been looking for an article about concealer and photography. Do you recommend any concealers for under eyes? I find concealer just melts off on me even with setting powder and some too cakey. P.S. Just click on the product names for more info!